As you may have noticed during your time as a COM major, alumni play a very important role in our degree program. COM alumni help keep us strong and make our program even better. We don't just need recent graduates to dig in and help, we need folks who have been out in the marketplace building careers for a long time and engaged in everything from graduate school to home-based businesses and all points in between. Alum who can come back and guest lecture, be a part of COM Studies Week, offer to be an internship supervisor, be available for mock interviews-or real ones, can greatly enrich our program in ways that we as faculty simply cannot do. 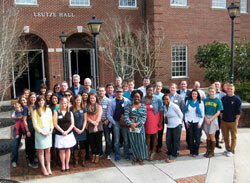 The UNCW COM Alumni Spotlight was created to bridge the gap between our Alumni and our current students. Your experiences, accomplishments, and advice are invaluable to our current majors. Follow the link and share your story! You may be featured on this site and receive a free gift from the COM Department! Believe it or not, we want to hear from you! Faculty-student relationships are very important to us and we want to know how you are doing. We would also like the ability to invite you back for some of our events, not only student events but other opportunities for you to network with your peers. Update your contact information with the Alumni Office, email your contact information to comstudiesalum@uncw.edu or join our Facebook group, UNCW Communication Studies Grads & Friends (please log in to Facebook before clicking this link) and our LinkedIn group. You should also check out our Alumni Chapter, COM Alumni Chapter and nominate yourself for our Alumni Spotlight! Beau Gunn, Anna Kooiman, Matt Harris and more COM Alumni have been featured on the university's We Are UNCW page! Check it out here, We Are UNCW.